Daihatsu started to make 3-wheelers in 1930 (Japan) though they have been established since 1907 as Hatsudoki Siezo Co manufacturing engines. Their first 3-wheeler in 1930 was essentially a 3-wheeled motorcycle with a luggage area located between the two rear wheels. The vehicles developed over time and became covered. 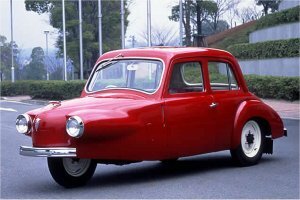 By 1956 Daihatsu were producing a 3-wheeler range that could carry up to 2 tons. In 1951 the company made their first passenger car; the Daihatsu Bee. Weighing 800kg the vehicle had 4 seats inside its fiberglass body. It was powered by a 540cc air cooled OHV flat twin engine that was mounted in the rear of the car. It is believed that the car did not sell well and as a result only 90 vehicles were ever made.